Blend flour, egg and salt. Leave in the fridge for at least 2 hours. Heat a large frying pan (diameter of at least 15 inches is best) over medium high heat. Melt butter; be careful not to put too much butter, as your crepes would be too greasy and not easy to cook. Pour about 1/4 cup of mixture in the pan making a circle. Then tilt the pan with a circular motion so the mixture fills the pan evenly. Cook galette for about 2mn or until borders peel off and bottom is slightly brown. Turn and cook the other side (1mn should be enough). Make all galettes at once, you'll go faster serving your guests later. Garniture: Heat olive oil in a small frying pan over medium heat. Slice cherry tomatoes in half and pour them into the pan. Add herbes de Provence mix. Take most of the tomato juice off the pan. Scrub Feta cheese (keeping some aside for decoration), add to the tomatoes. Season with salt and pepper and take off heat. Melt butter in a large frying pan over medium high heat. Heat galette quickly on one side (10 sec), then turn it to the other side. Add cheese tomato mixture, then top with ham. Close borders. Leave on heat for two more minutes. Serve it topped with a cherry tomato slice in half. Sprinkle with Feta cheese scrubs and herbes de Provence. 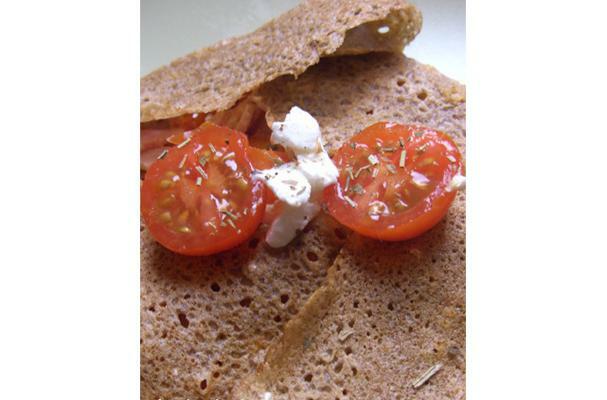 Galettes are supposed to be thin, if you make them like pancakes, it won’t be good at all.